I honestly don't know what this is, but it's the closest we get to a title screen. You are one of the Bloodwych. You must take on the persona of one of the last sixteen champions of Trazere. You must first explore Treidwyl, recruiting more champions, and gathering items to aid your task. Once you are prepared you must get the four crystals of storing from the towers. Take them to the fifth tower and there destroy Zendick, and banish the Lord of Entropy to the realm of chaos. To do this you will have to defeat the agents of Zendick. The Lord of Entropy has transformed many of the citizens of Trazere into weird monsters, and twisted the minds of many into those of psychotic killers. Some of these citizens may aid you, but many will try to destroy you. Good luck in your mission, and remember the spirit of the Bloodwych is always with you. Well. Glad we cleared that up. I think we're going to have our own "bad prose" competition on The CRPG Addict fairly soon. Bloodwych's aspirations to be Dungeon Master are blatant from the outset. Where the earlier game began with a novelette by writer Nancy Holder, Bloodwych begins with a tract written by whatever Image Works intern displayed the greatest knowledge of Saturday morning cartoons. In it, we learn that there was once a "secret order of psychic mages" called...wait for it...the Bloodwych. Ruling from the city of Treihadwyl, they governed the land of Trazere in justice and peace. But one of them--you saw this coming--craved more power. This wizard, named Zendick, overthrew the Grand Dragon of the Bloodwych, cast his fellow mages into the astral plane, and summoned monsters to roam the once-peaceful streets. Now he seeks to summon the Lord of Entropy to unmake the universe so he can remake it in his own image. But somewhere in the astral plane, a couple of the Bloodwych have gotten their minds together and possessed one of the Champions of Trazere and are impelling him to recruit followers to defeat Zendick. Thus, the game also copies Dungeon Master's odd framing device in which the on-screen characters are really being controlled or possessed by an off-screen mage. And, like the former game, you start by selecting pre-defined characters rather than rolling your own. There are 16 possible initial characters among four classes--fighters, mages, adventurers, and archers/assassins--with various inventories of items and spells, and various attributes of strength, intelligence, and charisma. ...had the highest charisma, but ultimately I setteled with "Eleanor of Avalon," who seemed like a well-rounded character. Whomever you choose, it appears that the other PCs are wandering around the starting area. Within moments after starting, I met the second guy in the top row, an orc-looking fighter named Astroth, and added him to my party. 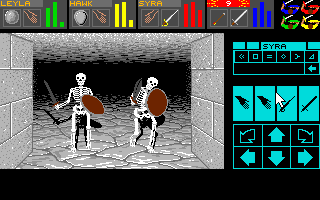 Navigation and commands are also extremely similar to Dungeon Master, as you can see from the screenshots below, both offering battles with skeletons. The interface elements are in different locations, but both offer icons for moving and turning, combat and defense, and arranging party members information. There are status bars for each character's health, stamina, and magic. Bloodwych has notably worse graphics and (at first glance) less complexity in combat tactics. You cannot assign individual fight commands to each character, for instance; you can only instruct everyone to fight. You also can't see each statuses for all characters; only one at a time. At first, these "downgrades" from Dungeon Master had me longing for the earlier game, but slowly I started to encounter some of Bloodwych's unique charms. To start, there are actual NPCs and a dialogue system. As you encounter NPCs wandering around the dungeon, you can ask questions about locations and objects, and even recruit them to the party (at least, according to the manual, on the first level). Slightly more advanced than "NAME! JOB! HEALTH!" 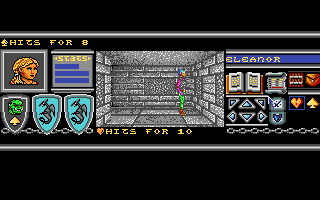 Second, the game has keyboard commands for movement, the lack of which was one of the things that bothered me most about Dungeon Master [Later edit: I misremembered; Dungeon Master had keyboard commands for movement. What bothered me was the lack of keyboard commands for other functions, like accessing inventory--something that hasn't changed in Bloodwych.] However, what it gains from these it loses from extremely small and numerous icons. This is not a game you can play on an airplane with your laptop's trackpad. Third, you collect gold in the game, and the manual promises some sort of economy--again, something I found lacking in Dungeon Master. Unfortunately, there are a number of things I already don't like. The sound, for instance. As far as I can tell, there isn't any--only music. The music is a relentlessly repeating passacaglia in some minor key that had me reaching for the mute button after only a few minutes. Neither combats nor opening doors produce any sound. I think it's a platform issue. I watched a quick YouTube video showing a C64 version with markedly worse graphics but some rudimentary sound. In addition to the combat, the spell system is also significantly dumbed down from Dungeon Master. While spells do seem to be composed of a selection of runes, you can't choose them individually or experiment; you have to "know" the whole spell. You can, however, adjust the power of the spell before casting. I haven't figured out what "magelock" does yet, but I suspect it locks doors. In gameplay terms, I've explored the first level, killed a bunch of nameless monsters (like Dungeon Master, you don't get any clues as to the names of your foes), and collected a lot of treasure from bodies and alcoves. I've collected one NPC, but I know where there are more hanging around, and after I have a chance to evaluate them, I'll round out my party with four. I haven't seen any obvious level progression yet. Fighting some guy who's not even facing me. Much has been made in various online reviews about the two-player option in the game, which I admit is somewhat impressive. 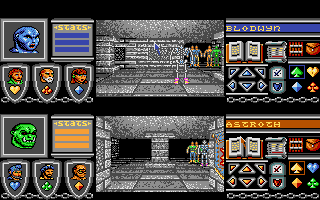 Two players can play cooperatively via a split-screen view in which the parties can see each other, fight the same monsters, trade equipment, and whatnot. Two parties view each other with a skeleton in between. The two players share the same keyboard: movement keys for the top party are on the right side and for the bottom party on the left side. Unfortunately, I can't figure out how to set it up so it recognizes a second mouse. I'd try harder, but I don't have anyone to play with anyway. That sounded sadder than I intended. Before I go, I want to hypothesize the conversation that must have occurred amongst this group of mages. Mage Leader: Well, we're a group of good mages who are going to rule the land in peace and justice. What shall we call ourselves? Zendick: How about the BLOODwych?! Bwu-ha-ha-ha-ha! Mage 2 (whispering to Mage 3): Do you think we're going to have problems with him later? They should've known he was a jerk as soon as he told them his name was "Zendick." Also, why the hell is so much of the screen empty in single-player? Were they not capable of making a larger interface? I don't think they wanted to design two separate interfaces, so the single-player interface is just one-half of the two-player interface, centered vertically. Probably. That is such a waste of screen estate and makes me kind of angry, especially with how small all the elements are. At least they didn't invite his brother, Buddhistasshole, into the order. Dammit, that would have been a perfect caption joke. I wish I was funnier. Wait, Trazere? Is this game in the same campaign setting as Four Crystals of Trazere? That game had an interesting magic system: you built spells out of runes whose effects were completely deterministic, kind of like a simple programming language. Legend (or Crystels of Trazere as was known overseas) is one of my favorite rpg's of the early 90s. Amiga Power tips pages were filled with questions from readers about that game because of its fiendish and brilliant puzzles. The Wikipedia entry suggests that Mirrorsoft--the same company that developed Bloodwych--was the original creator of Legend, AKA The Four Crystals of Trazere, but it went out of business shortly after, leaving Mindscape to continue with it. Legend and World of Legend had the best magical system ever made in a CRPG. Yes, some of them were hard to cast in real time, but totally worth it! "the game has keyboard commands for movement, the lack of which was one of the things that bothered me most about Dungeon Master." I don't understand why you think this. Dungeon Master had keyvoard commands for movement. In fact you could use both arrow keys for basic movement, or the num pad for both moving and turning. 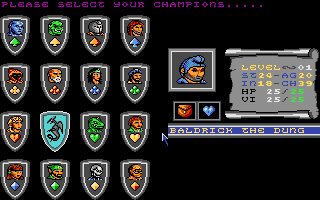 The interface of Dungeon Master made the game a dream to play, years before WASD+Mouse was even conceived of. Yep, DM definitely had keyboard movement. I played through it a couple of years ago and found that out halfway through the game lol. Made it a breeze to play in my opinion when compared to the mouse movement. My mistake. It's been a long time since I played DM. I remember complaining about the lack of keyboard use, but I guess I was referring to inventory and combat and such. I made an edit above. This game did an unvaluable work of introducing CRPG to a lot people. This one was released on Spectrum & Amstrad, the two most popular computers in the UK, Spain, France and other european countries... Dungeon Master never get a port to those systems, and Atari ST wad very expensive for kids / early teenagers, so we stick to ours Spectrums til beginnin' of the 90's. They got close to 0 RPGs for those systems! That's right. This was my first CRPG and I played it in my Amstrad CPC (64 KB RAM, awesome!). Later, I bought the PC version as well... because CGA graphics (VGA cards were absurdly expensive back then) were much better than the green screen monitor of my Amstrad (cough, cough). A pity there were not more (if any) CRPG's for the Amstrad platform available in Spain back in the day... I spent many, many hours playing Bloodwych (and mapping it... shame on you, modern automappers, you took half the fun off). The Spectrum later had another RPG, I believe one of the Bard's Tales was ported. That's a great bit of history that I never would have heard without my readers. Thanks for commenting! Yes, I played Bad's Tale I on the Spectrum. You had to rewind the tape when you went back upstairs in a dungeon! Enjoyed it, though. I suspect there were other CPGs too. Lords of Midnight was a strategy/rpg hybrid, for example. Rogue was ported too, but they neglected to include a random level generator. 1. Out of the Shadows by Mizar Computing from 1984. Graphical rogue-like light that had lots of nice features. Randomly generated overworld and dungeons, armur pieces for all body parts, armour could deteriate, enemies would flee if wounded or outmatched, enemies could fall down pits to next level if panicked, line of sigh so you only saw what your character would be able to see. Great game, but one one thing stops me from replaying it: instead of using single key strokes to move you have to to type in GO WEST or GO W if you want to take a step to the west, for example. The game was also real time, so you needed to be able to type fast. 2. Heavy on the Magic by Gargoyle Games (of Tir Na Nog fame) from 1986. More of an Adventure/CRPG hybrid than a CRPG since a lot of the game revolved around finding items and using them at the right places. But it has CRPG stats, combat and character interaction. You can even invoke demons and talk to them. I completed it back in the days, but when I tried to replay last year it it was maddingly difficult. Your character is so feeble, and monster interrupt you all the time, sometimes at places where you can't escape, and there is no easy way to regain health. This game also was real time. There was also Swords and Sorcery by PSS from 1985, but I never played that one. I forgot Heavy on the Magick. And of course Ti Na Nog and it's sequel. There were other games along the same lines. 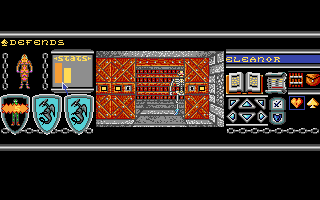 I think that it was not so much that the spectrum didn't get CRPGs, but that it didn't get many 'pure' CRPGs. There were plenty of strategy, adventure and action hybrids. And... he's back! Keep this up and I may have Star Saga Two summary done before you get to it. ;) I've been having a slow summer too though, I think it's the heat. I hope Magic Candle is more your style. Now I have to research if this game was developed in a place where they should have known the connotation. Published by Microsoft (image) and it appears it was written by three guys in the states. From what I remember of 89, those idiots where still seen as an actual threat, not like the dumb rednecks we tend to think of them as these days. It's more likely than not coincidence though, so I will try not to think badly of the guys who made the game. The game was published by Image Works, a label of Mirrorsoft - a video game publisher in the UK - as well as Konami. Also, I've found a Philip Taglione (the name of one of the developers) as a computer game developer in the UK on Linkedin. My guess is any link to the idiots in white bedsheets is purely coincidental. 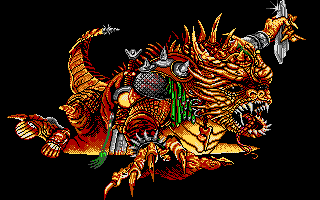 Besides, wizards are a staple of CRPG and fantasy and Grand Dragon has got to be one of the most generic names you could think of. KKK!!! I think that's kinda hilarious and I don't have anything against references to real life in games. I don't piss my pants every time I see something that's politically incorrect. Talking about politics, I can't wait for Star Control 2, full of politics or references to various things. Ahh that explains it Giuseppe. It jumped out to me because, back when I was a dumb punk KKK and nazi groups were free game and we wouldn't get into too much trouble with the police for smacking them around. They also represented a group we could focus violence on and not feel bad about it. A split-screen two-player mode was impressive back then, but I would've preferred a cleaner interface that doesn't cram everything in a narrow bar. Other than that it's just like Dungeon Master, only somehow less interesting. As always, you give a good, succint, funny description of the game. I enjoy your work. I am sure the Federal government will appreciate your prose in your two books. Thank you for perservering with the blog. Not sure why you don't have sound. With Adlib selected I hear some sounds when attacking or opening doors. You can try PC Speaker instead, that will give you some sounds and no music. I thought I'd cycled through them, but I'll experiment some more. Thanks. I suppose federal government manuals have to be better than the manuals in games. Wouldn't it be cool if one day you woke up in the land of Idiocracy (movie by Mike Judge) and then you went online and all the information on the .gov pages sounded like bad prose from a crpg manual? Most of it does. Even the stuff that I write. My work is edited by a subcontractor, which in turn is edited by a contractor, which in turn goes through about six people at the federal agency I ultimately work for. I write: "Run the following calculations in Microsoft Excel." The final version reads: "It is recommended that the reader utilizes a common spreadsheet application to perform a sequence of mathematical formulas in a manner consistent with federal, state, and local standards." I defy federal standards of mathematical formulation! Man was meant to be free! For me, for LIBERTY, it shall always be MSDPAE and not the neo-fascist PEMDAS! Since you've mentioned the order of operations, I just have to say I find it amazing how many people (the majority) fail to do those simple maths quizes on Facebook because they simply go from left to right instead of following PEMDAS. I guess it would be unfair for all the other spreadsheet applications if Microsoft Excel was mentioned. Maybe there would be a lawsuit from Apple or something. Also it would probably create problems if someone saved everything in some non standard format, I suppose that's why they have to mention standards. I was actually giving a somewhat absurd hypothetical example, but it says something about federal bureaucracy that everyone feels that it's a real one. The "It is recommended" part is real, though. I end up having to make a lot of recommendations based on unresearched or half-researched techniques and phenomena. Thus, when something is my own recommendation, I make it clear by saying "I recommend." The government insists on changing it to the passive voice. Drives me crazy. Am I the only one who learned it as BEDMAS? No, Britigeek and Trinigeek were just telling me they learned it that way, too. Government speak is certainly something else. They have to be really precise about what they're telling you for legal reasons, and there's usually mandates about what exactly you're required to say coming in from a dozen additional angles. So we give out notices to our clients that cover all our legally mandated bases and as a result often fail to convey the information we're trying to convey. As someone who answers client calls, it's a source of unending frustration. Okay so people other than me learned it as BEDMAS but why P instead of B, I don't get it? In American english, ( and ) are called "Parentheses" rather than "round brackets". Thus P instead of B.
I think we're going to have our own "bad prose" competition on The CRPG Addict fairly soon. @CA: As much as I love Johnathan Maberry's Joe Ledger series of novels, the fourth, 'The King of Plagues,' introduces the character, Dr. Circe O'Tree, who despite being a pretty good addition to the mythos is described in one shooting range scene as wearing a t-shirt because wearing something less revealing would just mean the men staring at her would 'win.' I wish I had the entire internal dialogue to copy here (will when my order for the latest book 'Assassin's Code'- gosh that sounds like the name of a penny-awful of 'Assassin's Creed'- comes to my public library- sadly they had no ebook copies to download at all) because it is down-right some of the most inane, sexist writing I have come accross. I may have misunderstood and not be talking about prose, but when I do post it I hope you can appreciate the passages awfulness as it ate at me. Also, read David Eddings' 'The Redemption of Althalus' at your own risk. It has an interesting-sounding premise, but the story and writing is utter crap (there has got to atleast be some prose in that humongous pile). If you're playing the PC version, hope you have the patch - years ago I hit a game-breaking bug (one dungeon level got corrupted) and since I had no internet back then I had to quit. Thanks for the heads up. I'll research it. One interesting note to me was that on Bloodwych's wikipedia page says the game had data disk, Data Disk vol 1 / Extended Levels. Probably only for Amiga / ST version but might be one of the first usages of data disk extension nevertheless. Can't remember if any games of that age had such except MS Flight Simulator which had additional Scenery Disks. 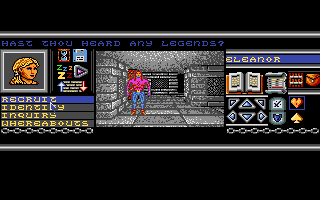 The 3D adventure game Mercenary (1985) had an expansion pack called "Mercenary: Second City" in 1986. The Japanese Dragon Slayer series has expansion packs in 1985 and 1986. Dungeon Master was planned to have an expansion pack that would add a few optional levels (this is why there's a seemingly pointless locked door without a key in one of the levels - the extra dungeons would have been behind that door). The expansion was later changed into the standalone sequel Chaos Strikes Back. It's not very common, but we've seen expansions going all the way back to Temple of Apshai. Wizardry 2 seemed more like an expansion than a sequel, despite the sequel numbering. It was, indeed. You needed the original Wizardry to create characters, even. This game doesn't look too hot. Why am I so inspired by it? Yearning to play this. 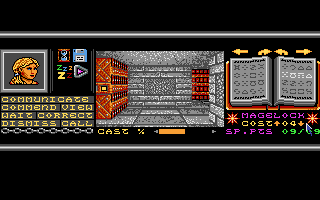 The GUi looks pretty interesting, I never got into it like I did Bards Tale and Dungeon Master though. Great site. 1 RPG you are missing is Centauri Alliance in 1990. I've hear it called Bards tale in Space. One cool feature is you can import characters from games like Ultima, and Bards tail. Graphics and plot are kind of dated compared to U4 and U5 even. But the difficulty is much harder. Just noticed you only do DOS/Windows games. Yeah, shame huh? There are plenty of old c64 rpg's I would have loved to see here. Reminds me of Baldrick in the Black Adder series. Especially the Baldrick in the fourth and last series is probably the most disgusting character I've ever seen in a TV show. To be fair, the fact he was dirty was quite realistic to a WWII soldier. I think it was WW1, but your point still stands. I wasn't mainly thinking about his appearance, but rather on his culinary habits. IDZ, thanks. Those are solid tips without spoiling anything. I tried to crank out another BW posting last night but my interest in the game began to seriously wane. I'll give it another shot this evening. I played Diablo for the single-player experience. I see no problem reviewing a game based on the merits of one of its modes and not the other. Obviously the review will only cover this aspect. Indeed. You might not be able to review a game in its entirety without playing every available game mode, but there's nothing wrong with judging one of them on its own. In my book if a game mode is that far from the standard of the other(s), maybe it shouldn't have been included in the first place. For example including a single player mode in a game that's really meant to be multiplayer somehow feels a little bit misleading to me, maybe even outright dishonest. IDZ, I didn't take your advice on the characters, mostly because I didn't want to start over. You seem to be suggesting that a two-fighter, two-wizard combo is best. Am I going to be overly handicapped by having one of each character class? Leveling seems awfully slow even with one party; I can't imagine how slow it must be with two. The simple fact is that I'll never play it at all if I wait until I have someone to play a second party. I'll watch for that area you're talking about.